When thinking about planting a garden in Chicago, starting in fall isn’t usually the best idea. 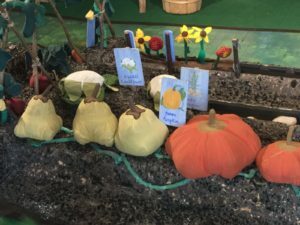 However, when your garden is set in pioneer America inside a children’s museum, anytime is a good time! The garden in the Brunk Children’s Museum of Immigration is one of the most heavily used features of the imaginative space. It is harvested and replanted countless times per day. Food from the garden creates grand meals served on the farm table. It is fed to caregivers who delightfully eat it with loud pretend crunches. The food is fed to the various animals throughout the Museum. Did you know that our horse prefers carrots fresh from the garden and while our mama pig likes cabbage best of all? Because of all the love it gets, repairs are made regularly. Our docents often mend our vegetables and sometimes new ones are added. One of the features of our garden has gotten a brand new look. Our garden posts that tell guests where certain vegetables should be planted have been remade. Ed Pomeroy, one of our members, recently created 13 brand new posts with wood from his land in the Upper Penisula of Michigan (he is also to thank for the new wooden tic-tac-toe game at our coloring station outside the Children’s Museum). They were painted and placed in the garden giving it a fresh new look. Not all the posts will be used at once so we are grateful to have extras in case one breaks. In addition to refreshing touches and repairs, we recently added a flower patch. This flower patch is nestled in the garden and contains 8 holes that hold wildflowers. Children can pick the flowers to give to a friend, display in a vase or collect in a basket. They then replant them for the next child to discover. We welcome you to come visit to see what’s new in our garden. You are sure to be delighted by what you see, and if you stay long enough, someone might just give you a taste of the yummy bounty!